While they may not share the same prestige, history or reverence as studio mics, wireless microphone systems are ubiquitous in modern communications. Far beyond the realm of music-making these mics are integral for beaming voice to ear, used in everything from filmmaking and broadcasting to journalism, business and education. In some instances, wired microphones are inconvenient and impractical, and in others, their use is simply not feasible. Technological innovators have addressed this problem as far back as the '40s, with early wireless prototypes being used for a variety of applications – from mic’ing up performers in theatres to broadcasting umpires in ball games. Since then, a huge amount of headway has been made – in the modern age, wireless mics are affordable, reliable and versatile. If you’re new to wireless microphones, there’s a little bit to learn. With more physical components, technical elements, and practical applications than traditional mics, using a wireless system may seem daunting, but once you get your head around the basics, they’re really quite straightforward. Let’s dive in. Wireless microphone systems are comprised of three fundamental components: the microphone, the transmitter, and the receiver. Typically, a wireless system will feature one of three mic types: handheld, headset or lavalier. The former is your standard, archetypal stage microphone ­– usually a dynamic or condenser. These will usually have a transmitter built into their body, making them quick and easy to set up and move around with. 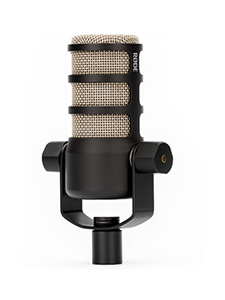 The RØDELink TX-M2 is a perfect example of a versatile, high-quality handheld wireless mic. You’ll find them used by everyone from stage performers to reporters to educators. As the name suggests, these are worn on the head, often over the ear, while a discrete arm positions the capsule very close to the mouth. Headsets – like the RØDE HS2 – are especially useful when subjects are in noisy environments or on the move, the mic stays the same distance from the mouth and allows the user to be completely hands-free. Headsets usually use the same beltpack systems as lavs – the RØDE Filmmaker Kit and Wireless GO are a case in point. Also known as ‘lav‘ or ‘lapel’ mics, lavalier microphones are small and unobtrusive, designed to be clipped onto the clothing of the subject doing the talking. This close proximity to the mouth gives them a good signal-to-noise ratio. It also eliminates a lot of the issues involved with achieving good audio quality with shotgun or on-camera mic placement. Lav mics are most commonly used in video and filmmaking, where a visible mic doesn’t fit into the context of what is being captured, or in a scenario where the subject needs their hands free. Lav mics connect to a transmitter pack, usually worn on the belt of the subject. They can take some time to set up (making sure they are positioned correctly and look neat, or in some cases, invisible) and are rather delicate, meaning they aren’t always suitable for run-and-shoot situations. Our Filmmaker Kit is a classic example of a wireless lav mic system. So, what does the transmitter actually do? As you probably guessed, its role is to convert the audio signal it receives from the mic into a signal that can be picked up by the receiver, then transmit it wirelessly. When it comes to digital wireless systems, this process involves converting the analog mic signal into a digital signal, which is then sent as a series of 1s and 0s to the receiver over a radio link. The receiver is at the other end of the radio link. It extracts the 1s and 0s of the digital signal and converts them back into the audio signal. These can either be single or multi-channel systems and, depending on their capabilities, are either larger desktop units (like our Performer Kit) or smaller camera-mounted units or beltpacks (like the Wireless GO). There are some disadvantages to consider when using a wireless system, such as latency, interference and environmental factors (such as ‘dead spots’ where signals cannot transmit), however, in many applications they are the best ­– or only – option. Wireless Microphone Systems: What Are They Used For? One of the key virtues of wireless microphones is their versatility; they are crucial to workflows in many creative and professional fields and have been central to the advancement of many media formats since their inception. 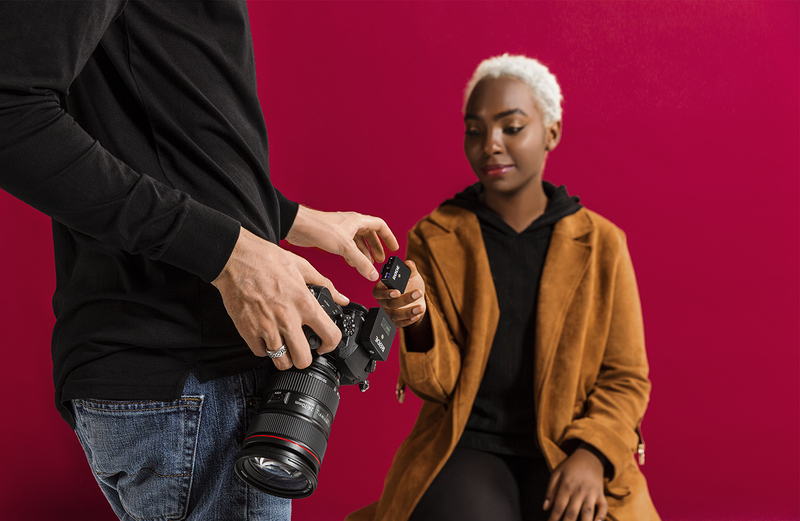 Filmmakers, broadcasters and vloggers have been the most avid adopters of wireless mic technology, particularly those outside the realm of feature films ­–­ budding videographers, content creators, video journalists and streamers. There are a few reasons for this, but one stands out above the rest: handheld mics don’t look great stuck in front of a person’s face. There are ways to record sound on set without using a hand-held microphone. On-camera mics are a great way to capture both primary and reference audio from a DSLR or video camera. Boom-mounted shotgun mics are another option. But if you need to close-mic your subject, and don’t want a hulking microphone in your shot (or cables threatening to trip you and your crew over), a wireless lav mic system is the way to go. Wireless mics are hugely beneficial in education environments, allowing teachers, lecturers and guest speakers to move freely and engage with students and reference material using their hands. Remote education is also on the rise, and the demand for lectures and classes to be recorded for live streaming and repeat viewing means that you will find recording devices used in most education institutions across the world. The same goes for any kind of presentation. From seminars to conferences to public events and houses of worship, wireless mics offer an effective solution to simply transmit and record audio. In many instances, stage performers require the use of their hands, meaning traditional mics are a no-go. Whether it’s for a rock show or a musical, wireless headset mics allow freedom of movement and reduce the risk of tripping over cables. And for large-scale performances, wireless mics significantly reduce the complexity and size of cable looms and runs. Digital wireless microphones are superior to analog systems in a number of ways. Sound Quality ­– Digital wireless microphones transmit audio signals that have been converted into 1s and 0s, which are not affected by the transmission medium. Analog systems, by contrast, send the audio signal as a modulated radio wave, which means disturbances or interference in the transmission will result in audio artefacts. Analog systems also rely on what is called a ‘compander’ to compress the dynamic range of the audio signal before it can be transmitted, which can lead to degradation of the audio signal. In high end analog units with quality components, this is usually not noticeable, but it can be an issue with cheaper units. Longer Battery Life – On average, the battery life of digital wireless mics is better than analog ones. Typically, digital systems require a lower power transmitter than their analog counterparts, which can result in up to 40% longer battery life. Security – Digital systems are encrypted, meaning the link is secure from eavesdroppers – whereas analog signals can be picked up by anyone in the vicinity with a suitable receiver. The wireless microphone you choose will greatly depend on what you intend to use it for. There are lots of options out there, each designed with a specific application in mind. Some cover many bases, others are tailored for a purpose, whether it’s on-the-go filmmaking or big stage performances. Some of the things you will want to consider when choosing a wireless mic. Microphone Type ­– Do you want a wireless system with a handheld, lavalier or headset microphone? Each mic is suited to different scenarios, so the kind you need will be fairly obvious. Range ­– Different systems have different transmission ranges, ranging from short distances to hundreds of feet. A good rule of thumb is to think about how far you will usually be from your subject, then doubling it to be safe. Range is often reflected in the price of a system, so don’t go spending hundreds of dollars on something with greater transmission capabilities than you need (or do! - you never know when you might need that extra distance). Size – Wireless systems come in a range of sizes, from ultra-compact like the Wireless GO to larger desktop units like the Performer Kit. If you’re constantly interviewing remotely, shooting on-the-go, or need something that is discreet, the smaller the better. If your system is going to be sitting in a classroom or the back of a club, something with larger controls and screen will be easier to operate. Battery Life – Battery life is an important feature to consider when choosing a wireless mic. However, keep in mind that battery life, size and range should all be taken into consideration together. If small size is very important to you, you may have to sacrifice battery life. Or if range is your biggest concern, a larger unit may be your only option. Think about what is most important to you and make your pick to suit. Latency ­– The reality is that, with digital wireless systems, latency is part of the package. This is because transforming an analog audio signal into digital binary code (during the transmission stage) takes time. How much time is something you will want to investigate. Check out a mic’s max latency time in its spec list. RØDE’s Filmmaker Kit and Performer Kit operate with a maximum of 4ms of latency, which is negligible. RØDE is world-renowned for making the best wireless microphones on the market. 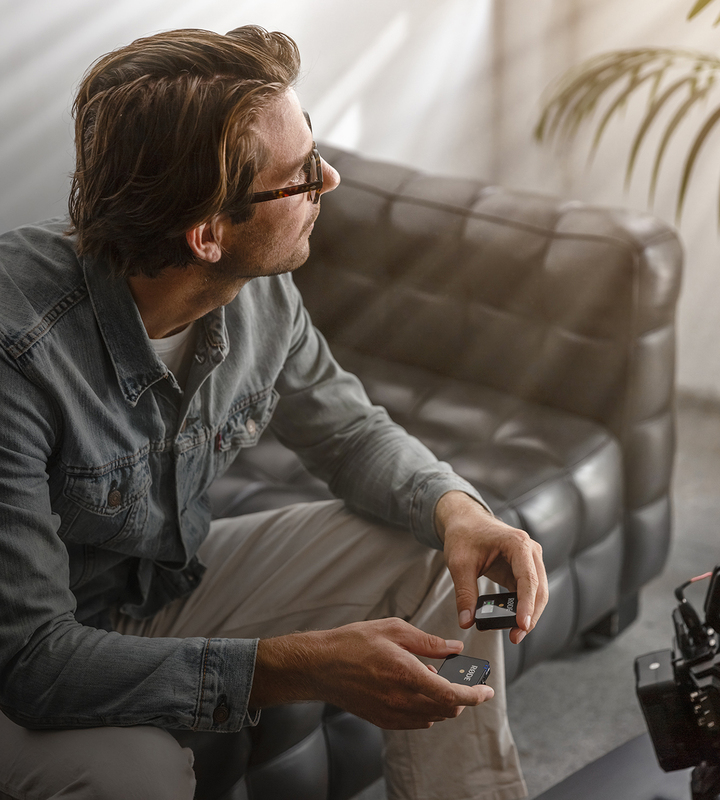 Our range offers a selection of wireless solutions for everyone from filmmakers to musicians to professionals, all built with superior components and unmatched features, delivering incredible audio quality, versatility and reliability. Wireless GO is the smallest and most versatile wireless mic system in the world. It offers the best of both worlds when it comes to wireless recording: yes, you can easily plug a standard lapel mic like our Lavalier or smartLav+ into the compact transmitter as you would any other wireless system, but it also features a high-quality omnidirectional condenser mic built into the transmitter, meaning that if you’re in a high-pressure situation where you need to be nimble with your recording, or if you just don’t like messing around with lav mic cabling, you can simply clip the pack onto the shirt, jacket or tie of your subject and you’re good to go. It’s the perfect wireless mic solution for content creators in all disciplines: filmmakers, on-camera presenters, newsgatherers, vloggers and more. 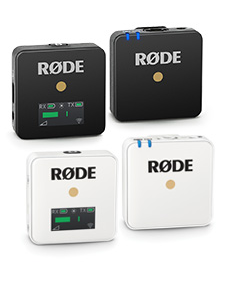 The RØDELink Filmmaker Kit is the industry standard in on-camera wireless audio capture. Using a Series II 2.4GHz digital transmission with 128-bit encryption, it is able to constantly monitor and hop between frequencies to maintain the strongest possible signal level at a range of up to 100 metres. The kit comes with our compact TX-BELT transmitter, RX-CAM receiver and our broadcast-quality omnidirectional Lavalier mic. 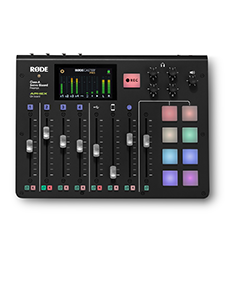 The RØDELink Newsshooter Kit is all you need to capture incredible audio for ENG and reporting. It also uses a Series II 2.4GHz digital transmission with 128-bit encryption to hop between frequencies to maintain the a strong signal level at a range of up to 100 metres. The kit comes with everything you need to start recording right away, including our TX-XLR wireless transmitter (which can be plugged into any XLR mic) and RX-CAM receiver. The RØDELink Performer Kit is a versatile wireless mic solution, perfect for lectures, live performance, weddings and school presentations. Featuring the TX-M2 handheld condenser microphone, which pairs with a RX-DESK desktop receiver, the Performer Kit is highly intuitive, with one-touch pairing between transmitter and receiver and dual signal transmission to ensure audio is as secure as a cabled connection. Find out more about RØDE wireless innovations here.